The world lost a tender, beloved soul this week when Mary Oliver passed. She was a poet for people who don’t understand or like poetry. She was certainly a constant source of inspiration for me in both the way she wrote and in the way she lived. Her passing did not get the kind of headlines that a rock star or politician might, but the grief I felt in learning she was gone mixed and mingled with the more personal grief I feel over the current state of things in our corner of the world. One of my good friends told me I tend to bury the lead sometimes, so there it is—front and center, the big happy news we’ve been waiting for. And we are happy. We believe this is the best outcome for everyone involved, including the girls’ birth parents. The gravity of their decision is not lost on us, and we will never take for granted the gift they’ve given us. Adoptive families know that the joy of being together forever comes at a price, and while this week has been full of tiny reminders that forever has started, I am also sifting through the future loss I know my kids will feel. There will be questions. There will probably be confusion and anger. The thing that feels the heaviest about all of this is that I know I will be responsible for crafting the narrative to answer those questions, to cradle the confusion and anger. On the surface, this development appears to be miraculous. I do not want to downplay the hand of God, but I do want to say this: this miracle is two years in the making. The people who walked into that courtroom to surrender their rights are not the people we met two years ago. The people who walked into that courtroom were people we have intentionally pursued and grown to love in a way that only makes sense through the lens of a miracle. The first time I met F’s dad, he was angry, bitter, and mean. The man who surrendered his rights is a gentle, respectful, thoughtful father who chose to make the best choice for a daughter he loves. It is my great hope that we have laid a strong enough foundation with him that he trusts us to stay in communication. For now, I am trying to give him the space he needs to grieve while always leaving the light on. Let’s talk about the girls’ mom, though. She is 33 weeks pregnant, and she really wants to keep this baby. I cannot predict the future, but I can say that she is doing as well as I’ve ever seen her in the last two years. She’s been clean since the beginning of this pregnancy. She enrolled herself in GED classes. She’s communicating regularly with me. She’s moving into a home where she will have support from counselors and support staff. The fact that she is willing to pick herself up and try this again is astonishing to me—she is using her grief/relief from the surrender to motivate her. I know the road will be long and hard, but she is trying her best. The fact that she is allowing us to still be a part of her life is another gift. On Thursday, we went to dance, and F stopped in the parking lot to stare. She looked up at me as I jostled her sister and the dance bag and said, “MOMMY, IT’S A RAINBOW!” And we stood together talking about every color we saw. Beauty sees beauty. I could not ask for a better metaphor for our life. On Saturday, F had her final visit with her dad. Our case assistant, Leah, asked if she could have a picture with the girls before she left. She has been a part of our journey for a year and a half. The other day, F was drawing a picture of our family, and it had me, Scott, the boys, her sister, and Leah. I couldn’t even look Leah in the eye as she was leaving because she is another gift we received on this journey, and I didn’t want to fall apart in front of her and the girls. 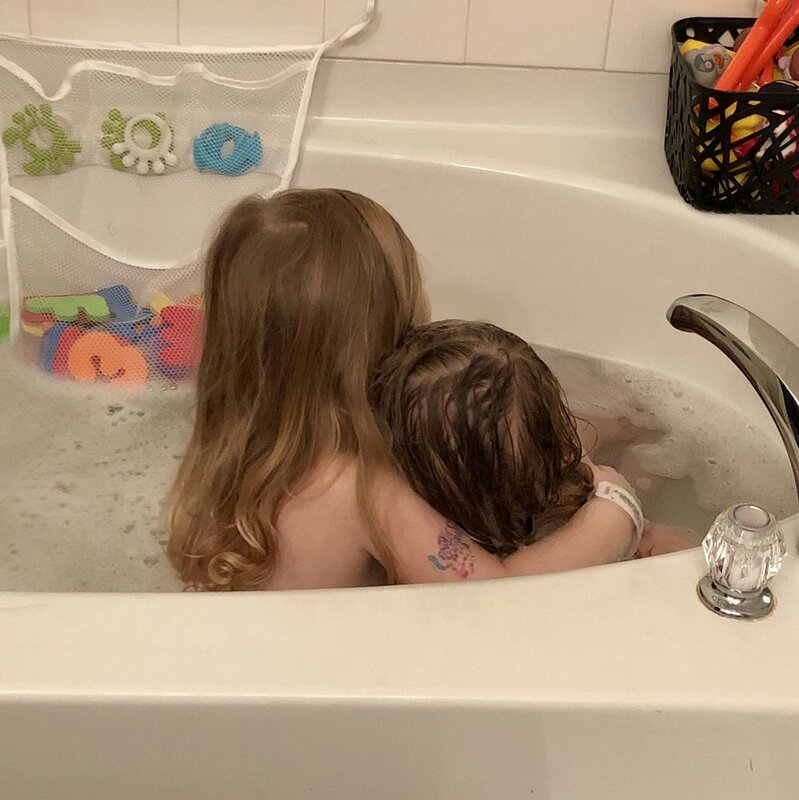 Saturday, the girls were playing “Mommy and Baby” in the tub—one of their favorite games. I heard E say, “I love you, Mommy.” F said, “I love you, Baby. I love you forever.” BECAUSE SOMETIMES LIFE IS LIKE A HALLMARK MOVIE AROUND HERE. I picked up their first mom (and her mom) to take them with us to F’s eye appointment on Friday (all good news on that front!). Our conversations are a little awkward and very frank. When you venture together into this kind of weird world, no one has time for polite banter. We’re all trying to figure this out. And I feel so damn lucky. I was texting with their first mom last night about some funny things one of the girls was doing, and this was her text back. I may have cried a little over those simple words—I love that she feels empowered enough to know the role she has played in this. She chose this for all of us. This morning, I took her to get some blood work done. She doesn’t like needles and was nervous about it. When she came back to the waiting room, she said, “You should have gone back with me. When my mom comes with me to stuff like this, I always make her hold my hand.” I hear you, sweet Mama. I pulled up my to do list when I sat down at the computer this afternoon, and I deleted something. I had a recurring reminder for every Saturday to “Update the Girls’ Calendar.” Every Saturday for approximately 111 weeks, I have input notes into a document about the girls’ developmental progress, their visitations, and any other relevant information to our case. I don’t have to do that anymore. Each of these moments has built on the last to help me see a clearer picture of what the future holds. For now, I’m paying attention—I do not want to miss a single thing that might help me unlock the mystery of navigating joyful grief. And believe me—I am astonished. Thank you for giving me someone to tell about it.